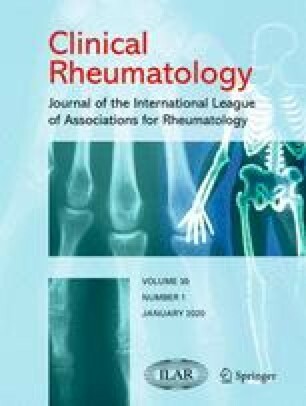 The aim of this study was to compare the efficacy and safety of an oral enzyme–rutosid combination (ERC) containing rutosid and the enzymes bromelain and trypsin, with that of diclofenac in patients with osteoarthritis (OA) of the knee. A total of 103 patients presenting with painful episodes of OA of the knee were treated for 6 weeks in two study centers in a randomized, double-blind, parallel group trial. Altogether, 52 patients were treated in the ERC group and 51 patients were treated in the diclofenac group. Primary efficacy criteria were Lequesne’s Algofunctional Index (LFI) and a ‘complaint index’, including pain at rest, pain on motion and restricted function. The efficacy criteria were analyzed by applying the Wilcoxon–Mann–Whitney test that provides the Mann–Whitney estimator (MW) as a measure of relevance. Non-inferiority was considered to be proven if the lower bound of the 97.5% one-sided confidence interval (CI-LB) was higher than MW=0.36 (benchmark of not yet relevant inferiority). Both treatments resulted in clear improvements. Within the 6-week observation period, the mean value of the LFI decreased from 13.0 to 9.4 in the ERC group and from 12.5 to 9.4 in the diclofenac group. Non-inferiority of ERC was demonstrated by both primary criteria, LFI (MW=0.5305; CI-LB=0.4171) and complaint index (MW=0.5434; CI-LB=0.4296). Considerable improvements were also seen in secondary efficacy criteria, with a slight tendency towards superiority of ERC. The global judgment of efficacy by physician resulted in at least good ratings for 51.4% of the ERC patients, and for 37.2% of the diclofenac patients. In the majority of patients tolerability was judged in both drug groups as very good or good. The current study indicates that ERC can be considered as an effective and safe alternative to NSAIDs such as diclofenac in the treatment of painful episodes of OA of the knee. Placebo-controlled studies are now needed to confirm these results. The authors are indebted to Dr V. W. Rahlfs, IDV, Gauting, Germany, for performing the statistical analysis. We are grateful to Dr Mehnaz Rashid, Pacific Pharmaceuticals Ltd, Lahore (Pakistan) for her advice and support in conducting this trial, and to Dr W. Schiess, Mucos Pharma, for helpful assistance in preparing this manuscript.